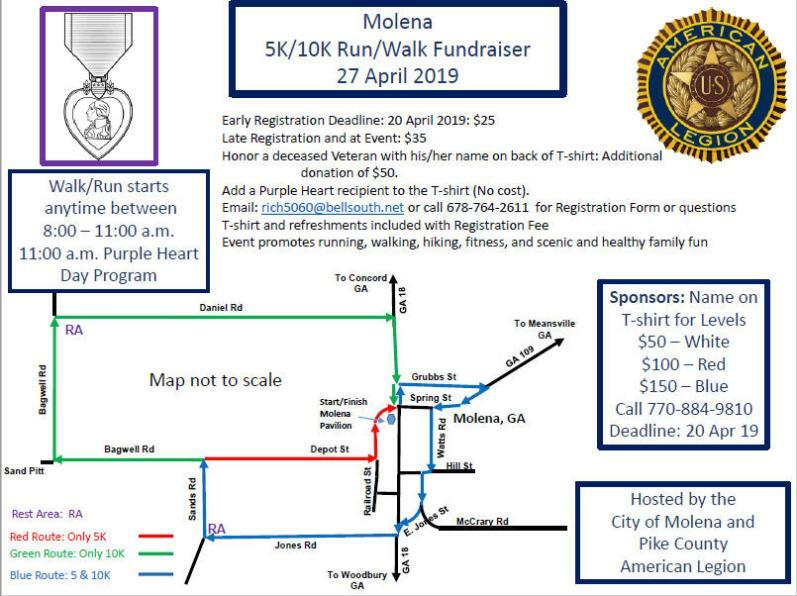 MOLENA - On 27 April 2019, the City of Molena and The Pike County American Legion will host a Molena Purple Heart Day. All events start or occur at the Molena City Park Pavilion at the intersection of GA 18 and Spring Road (GA 109) Molena, Georgia. Initiating the day’s activities is the American Legion’s ninth overall and second in the City of Molena 5K/10K Run/Walk fundraiser. The event resembles the German Volksmarch type of activity. Participants can arrive and start at their leisure any time between 8:00 to 11:00 a.m. There is a choice between a 5K (3.1 miles) and a 10K (6.2 miles) course. Depending on the course chosen, participants will enjoy historic sights of Molena, scenic homes, and vistas of Pike County country roads, countryside, and farm activity. Participants can either walk, run, or walk/run either of the courses. It is not a race; there is no mass start. Each course will be well marked with directional and mile markers. There are rest areas on the courses where participants will get their participation cards marked and can partake in assorted refreshments to help them through the course. Refreshments are also available after completion of the courses. Early pre-registration is $25. Late registration is $35 after 20 April 2019 and day of the event. All who register will get a nice looking event T-shirt honoring Purple Heart recipients and free event snacks and beverages. Each registrant is guaranteed a T-shirt. Due to late registration, a T-shirt will not be available on the day of the event; however, one will be mailed. 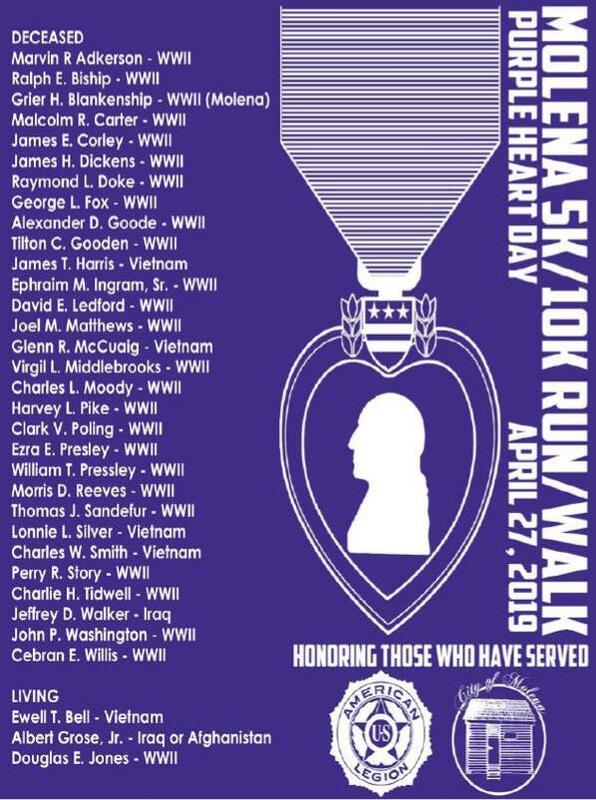 So, register early and wear your T-shirt on the walk/run to honor our Purple Heart recipients. Those who registered, but could not attend, a T-shirt will be mailed. To get a Pike County related Purple Heart recipient (family member or friend, living or deceased) listed (at no cost) on the front of the T-shirt, please contact me. Also, as part of our quest for sponsorship, for a donation of $50, the name of a deceased Veteran will be added onto the “In Memory of Veteran:” listed on the back of the T-shirt with the event sponsors. The Run/Walk is a charity event to benefit the American Legion Post 197 Veteran and Community programs while at the same time providing a healthy event for the community. For additional information, contact the Event Director, Bryan Richardson, at 678-764-2611 or email: rich5060@bellsouth.net. If you can’t make it for one reason or another, please help spread the word about the Run/Walk event. The City of Molena will host follow-on Molena Purple Heart Day activities starting at 11:00 a.m. The program includes: honoring deceased and living Purple Heart recipients, related remarks by guest speakers, “History of the Purple Heart, the unveiling ceremony of the Molena Purple Heart City, and special music. Post 197 will have a Veteran information booth as well as the paperwork required to obtain a lost Purple Heart Medal or other one-time issued medal. Questions on the Molena Purple Heart Day program can be directed to the City Clerk, Tausha Grose at 770-884-9711 or email to molenacityhall@bellsouth.net. So time your Run/Walk with attending the Purple Heart Program, and brunch or lunch at one of our sponsor’s eating facilities in Molena either before or after the program.